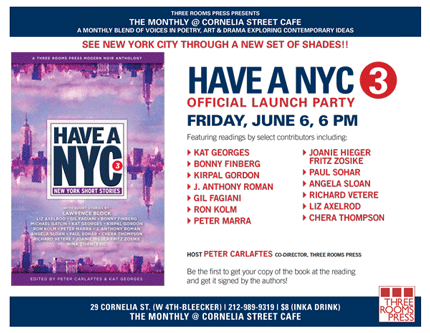 Join the fun as we celebrate the launch of HAVE A NYC 3: New York Short Stories, the third installment of the thrilling anthology of provocative short stories based in New York City. This version includes work by renowned crime/thriller author Lawrence Block (Hit Me, Eight Million Ways to Die), Richard Vetere (The Writers Afterlife, The Third Miracle), Kirpal Gordon (New York at Twilight: Selected Tales of Gotham’s Weird & Eerie), Paul Sohar (True Tales of a Fictitious Spy), Ron Kolm (Divine Comedy), Bonny Finberg (Kali’s Day) along with Liz Axelrod, Gil Fagiani, Michael Gatlin, Peter Marra, J. Anthony Roman, Angela Sloan, Chera Thompson, Nina Zivancevic and Joanie Hieger Zosike. The book is edited by Three Rooms Press co-directors Peter Carlaftes (I Fold With the Hand I Was Dealt, A Year on Facebook) and Kat Georges (Our Lady of the Hunger). The book is part of the Three Rooms Press Modern Noir Anthology series and will be available for purchase and signing at the event. Doors open at 5:45. Admission is $8, which includes a free drink. Cornelia Street Cafe is at 29 Cornelia Street, in the West Village, between W. 4th Street at Bleecker (http://corneliastreecafe.com). Reservations and additional information: info@threeroomspress.com. Have a NYC 3 is the part of The Monthly at Cornelia Street Cafe, a unique series curated by Three Rooms Press that brings together leading poets, intellectuals, performers and budding rebels on a different topic each month.